The driving force behind the establishment and continued development of Uphill Junior School is the school’s charismatic Founder and Director, Muhimbise Elius, seen below in the centre photo. Elius comes from the local area and his own educational experience was a hard-fought affair. Even as a child, he had to work to fund his own schooling and he continued to do this throughout tertiary education. 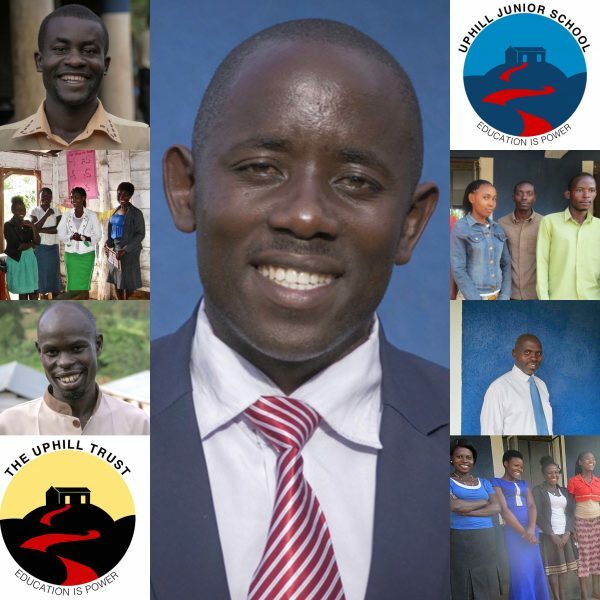 From Universities in Uganda, he holds a Certificate and Diploma in Education (Primary), Certificate in Public Administration & Management and he is currently studying for a Bachelor Degree in Public Administration. He has also been awarded a Certificate in Environmental Sustainability from Massachusetts Institute of Technology in the United States. 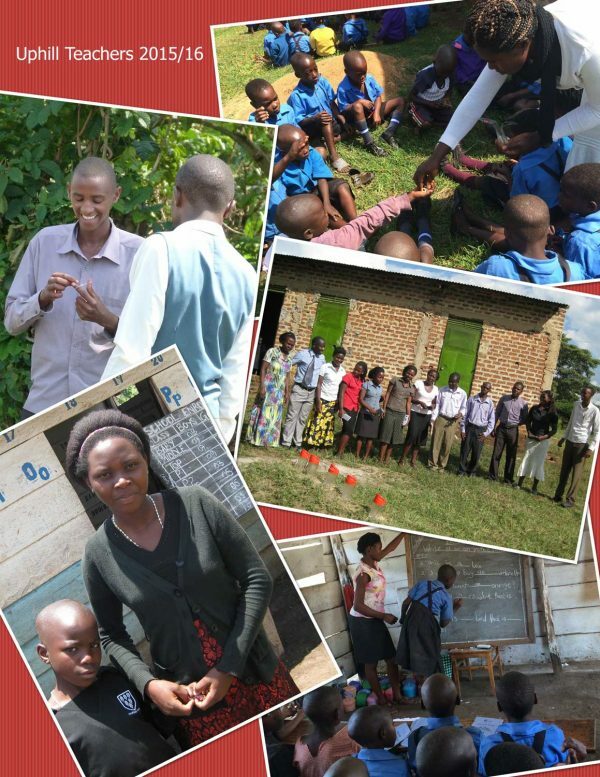 Since the school was founded in 2011, he has clearly demonstrated the skills, vision and drive to make a success of the Uphill school project, so long as funding can be maintained. 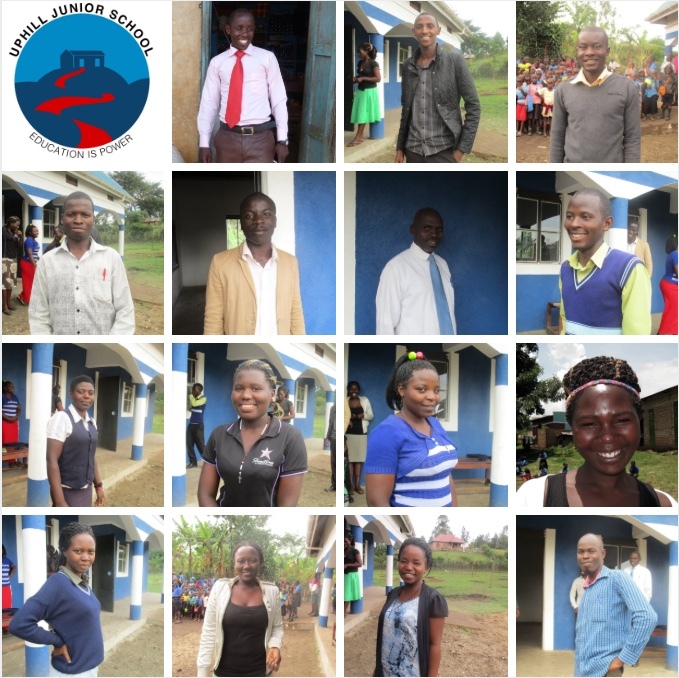 Although the school started out with only two volunteer teachers, Elius is now supported by a staff of thirteen teachers and a full time bursar, each with a defined responsibility within the school in addition to their teaching duties. The teachers change on a fairly regular basis as they move to new opportunties to advance their careers or return to University to further their studies – teaching in a rural school is seen as a stepping stone for many – but the growing reputation of Uphill Junior School continues to attract good teachers when vacancies arise. Whenever we visit the school we are always impressed by the commitment of the teaching staff and the children are thriving under their tutelage. Good teachers make a good school, and the promise of regular income, paid on time, is one of the reasons that Uphill is always able to recruit staff when needed. 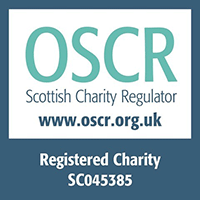 Currently all the salaries are covered by regular donations from our core supporters. Would you like to help keep a good teacher at Uphill?